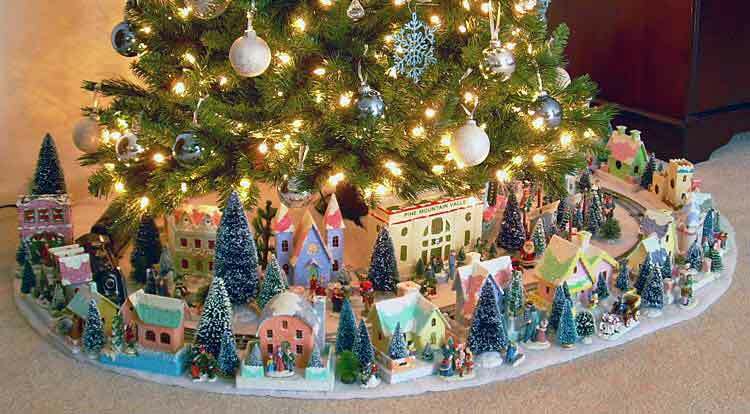 Howard Leroy Lamey’s 2010 version of his annual Christmas layout in Jacksonville, Florida USA, features his well-known “glitter houses” and starts our celebration of Magical Moments with a sentimental visit to Memory Lane. 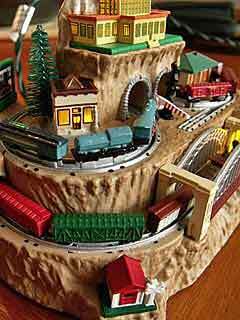 Many model railroaders fondly remember from their childhoods the “magic” of a train set under the tree! The classic Marx Commodore Vanderbilt locomotive (behind the houses at left) was a childhood favorite of both Howard and Carl A. For more about his work, see Howard’s website. 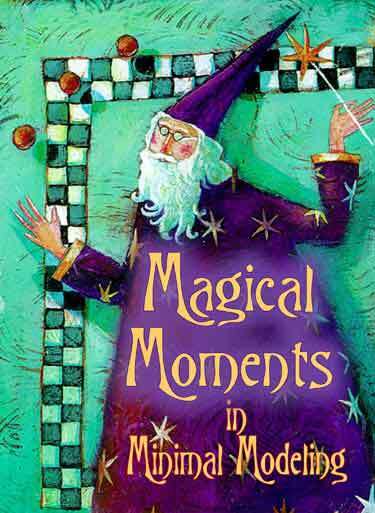 What’s a Magical Moment? It happens when we encounter something that makes us exclaim “Wow!” or “Brilliant!” or “How charming!” or other such expressions. In minimum-space layouts, it involves seeing a display that evokes reactions like those, including a tiny stirring of the little hairs at the backs of our necks. Here are a few examples that have affected me that way—I hope you enjoy them as much as I do! And happy holidays to all! 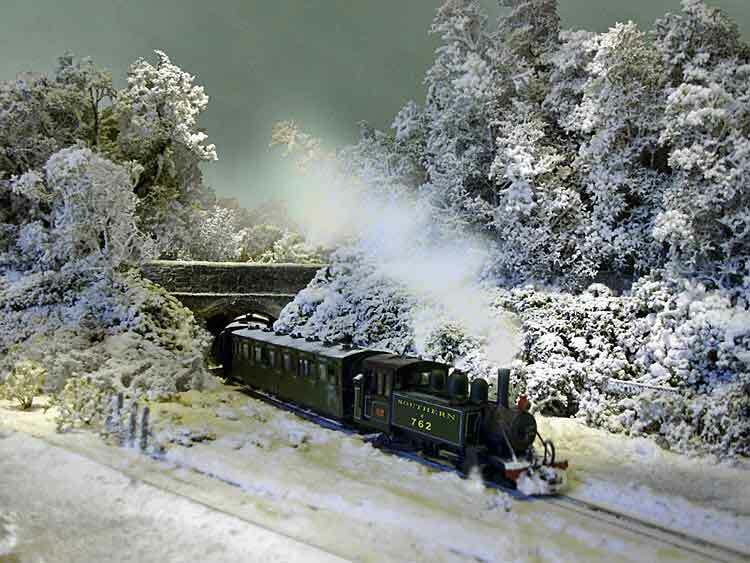 “Awesome” would be an appropriate “magic” word to describe this winter scene, modeled on the well-known two-foot-gauge English line, the Lynton & Barnstaple (currently under restoration). John de Frayssinet, who lives near Ludlow, Herefordshire, England, has observed and modeled snow and drifts more carefully and accurately than I have ever seen. And he generously shares his observations on his website. 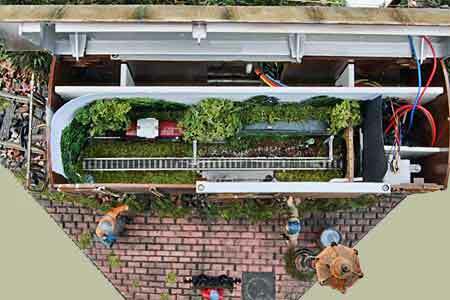 The model reproduces Bratton Fleming, a through station on the line, virtually at full OO9 scale size. 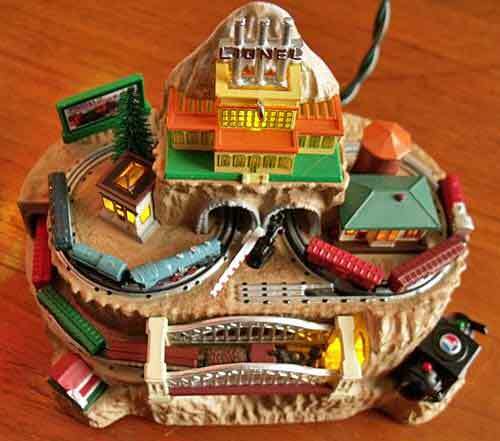 The line curves around behind the backdrop to create a full oval, and a passing siding (loop) holds a second train which can run by in the opposite direction. 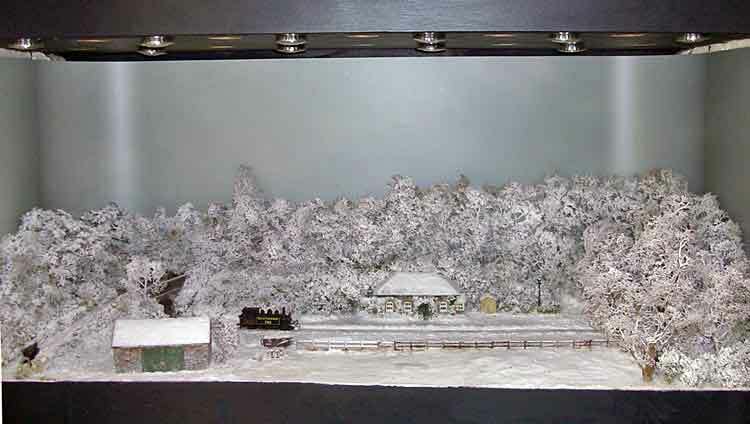 Let’s hold our breath and watch the wondrously realistic snow with narrow-gauge trains in it! INSET: This unretouched photo shows the original production model of MikeSpike, an N-scale executive toy train by Mike Stroz. Track plans available on request. Paul Schrön, from Hamburg, Germany, travels 500km to his Grandmother’s house to be with his family in Dresden at the holidays. 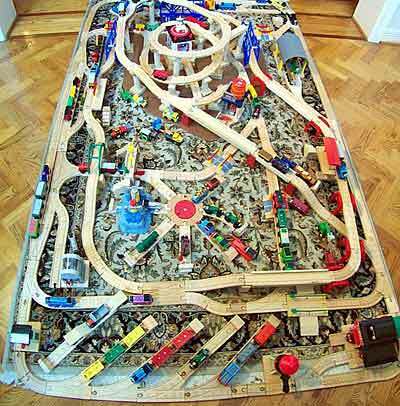 But he’s also responsible to provide a model railway for all members of the family to play with, regardless of age. 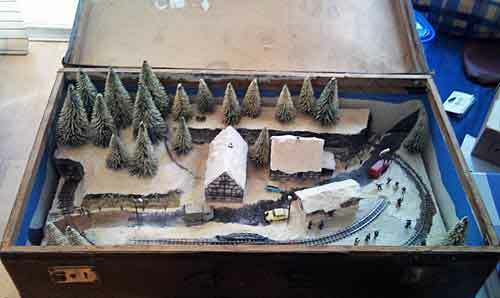 So he built this “beguiling” HOe railway (1:87 on 9mm gauge) in a suitcase! 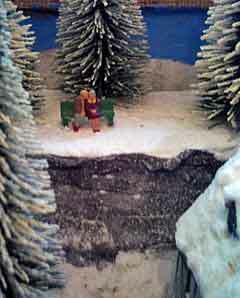 Paul explains, “The layout, built in a 40x70cm (16x28in) suitcase, is called Holzmühle (Sawmill) and represents a tiny village somewhere in the Erzgebirge mountains. A lot of detailing is still left, but you can bet it will be done before Christmas.” The smaller photo (upper right) shows Paul’s grandparents awaiting the family’s arrival. 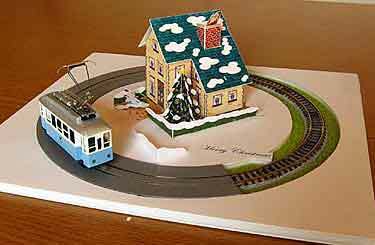 Over the years a number of people have suggested to me the idea of making a “pop-up” model railway, but to the best of my knowledge Shozo Kitamura, from Japan, is the first not only to make one but also to turn it into a Christmas card! With amazement we present his Christmas Pop-up Micro Pizza Pike. When you open the box, remove the foamcore package and open it, you get a “surprise!” To watch how it works, click on the arrowhead below. Shozo also has a blog (in Japanese) about it. 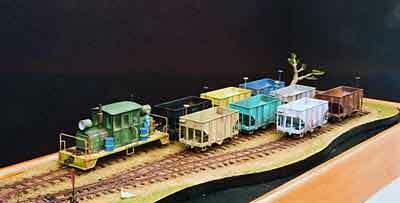 Micro/small layouts are not a new phenomenon. They’ve been around nearly as long as model railways. We’ve collected a group of historical curiosities that, although they’re not really milestones, are certainly interesting events in the history of the hobby. If any of them makes you sit up and say, “Aha!”, then you’ll have created your own historical Magical Moment. Painted tin plate. Object of the game is to reverse the train. It can be done in 19 moves. From The Jerry Slocum Mechanical Puzzle Collection at Indiana University, Bloomington, Indiana, USA. Thanks to Dr. T.D. Mitchell for calling it to our attention. 1945 Thomas the Tank Engine is Born! Thomas celebrated his 65th anniversary this year (or at least his publisher did). In 1945, Thomas first rode the rails on the Island of Sodor, chronicled by the Reverend W. V. Awdry. 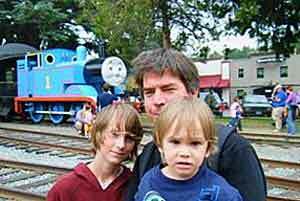 The rest is history: Members of Carl’s Clan enjoyed an afternoon riding behind Thomas at the Northwest Railway Museum in Snoqualmie, Washington, USA; each year Steve Goodman, from Texas, USA, builds a new Thomas layout limited only by the area of his house’s entrance rug. 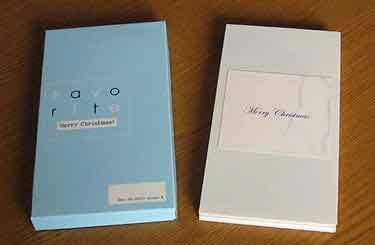 The “amazing” 2008 model is shown. 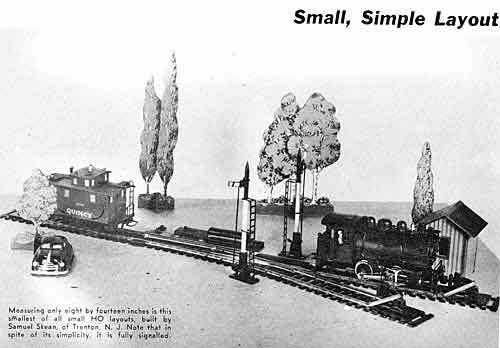 Railroad Model Craftsman magazine, long a U.S. leader in layout design ideas, featured in February 1953 (left) a short item about Glyn Lewis and his TT-scale layout measuring 20×30 inches… “astonishing” and miniscule by the standards of the day! 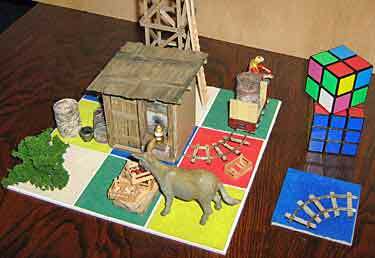 Coming up to the present, RMC features in its December 2010 issue a captivating article by Editor Bill Schaumburg about “Mini and Micro Layouts,” even mentioning this site. Continuing zestfully to seek out ever smaller micro layouts, RMC in March 1957 featured “the smallest of all small HO layouts,” this 14x8in effort by Samuel Skean, from Trenton, New Jersey, USA. The caption adds: “Note that in spite of its simplicity, it is fully signalled.” “Delightful!” Thanks to Larry Rickert, who unearthed both this “fork” layout and the previous RMC article presented above. Many British readers will recall with pleasure the series of “innovative” layouts by J. Allan Patmore during the 1950’s to 1970’s… all named, oddly enough, Larpool & Easington. Stephen Pugmire now owns a 24x18in TTn3 example of the genre, which he is currently exhibiting. Surprisingly, the layout holds up very well compared to present-day works, despite being “over 30!” It represents a now-classic branch line terminus-to-junction design. The layout is entirely self-contained: the line at the terminus of Larpool (upper right corner) does not penetrate the wall. Thanks to David Thomas who recognized Patmore’s historical gem and provided photos. LOOKING FOR FUTURE MODELING MAGIC? SCIENCE MARCHES ON! Some magical ideas require no explanation. This one speaks for itself… so be sure to turn on your computer’s sound before clicking on the video arrowhead! You might well ask, why is this magical? Arthur C. Clarke, the well-known science-fiction author, famously wrote, “Any sufficiently advanced science is indistinguishable from magic.” This example is surely very near the border! Thanks to June Idzerda for finding this jewel, and to her husband, MJ, for sending it in. 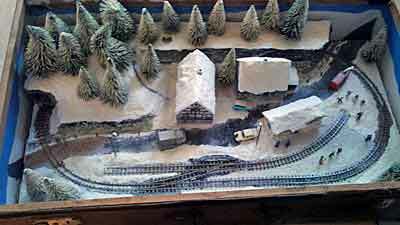 John Johnsey, from Midland, Michigan, USA, made very clever use of colors to enhance the experience of his 70x12in (178x30cm) Inglenook layout, Dead End Gulch RR. 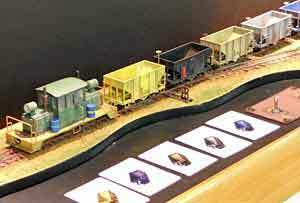 For example, he differentiates among the eight identical On30 Boulder Valley short hopper cars by finding eight varied colors to paint them. The cleverness comes from the fact that all eight colors are recognizably prototype-accurate hues! No neon green nor lipstick pink needed! Another example is his use of “black surround” colors (a la Totternhoe) to border his entire line, setting the trains off like diamonds on black velvet and making shunting a more exciting experience. The way color can enhance a layout is truly “mesmerizing”! 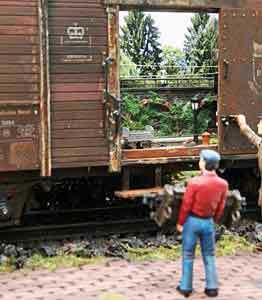 John is a professional modelmaker, and he also scratchbuilt the little two-way transfer loco in On30 scale. This layout is for sale, and John has authorized me to put him in touch with anyone who is interested (an unpaid job!). 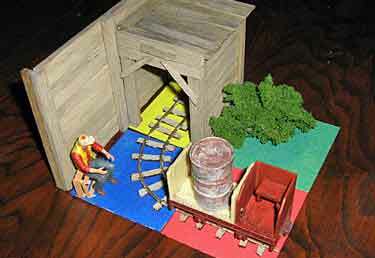 THE RABBIT IN THE HAT: N SCALE LAYOUT IN G BOXCAR! Magicians may carry rabbits in their top hats, but Martin Boogaard, from Meppel in The Netherlands, specializes in building layouts in highly “unexpected” places, such as LCD screens, CRT cabinets, and microwave ovens. 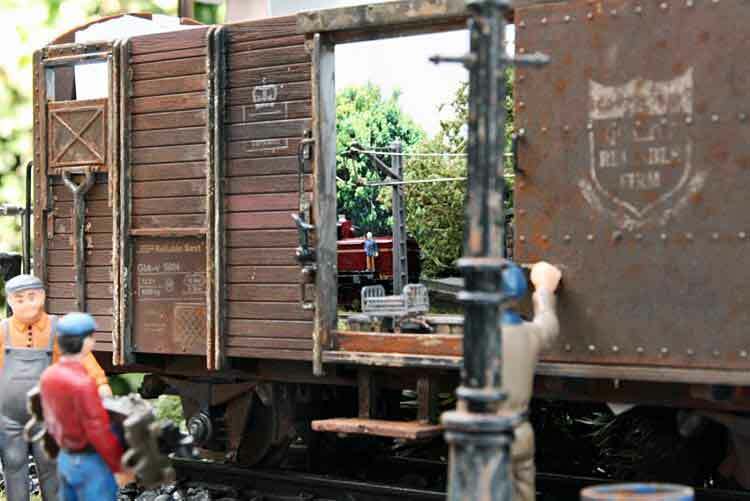 His most recent work really astonishes, and I quote him: “It’s a working layout in N scale, built in a small G scale wagon with its own scenery (a triangle 18.9×18.9in or 48x48cm).”Martin emphasizes the technical difficulties involved with creating his magic effect. 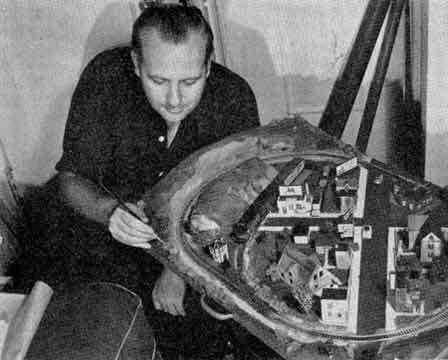 “Instead of building one scenery, you’ll have to build two of them including all the electronics and lights in two different scales. 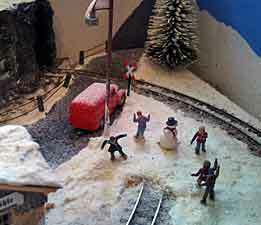 The layout includes working lights in both the scenes, a working sliding door that can be opened by one G figure (electrically operated), a running N scale train in a complete scene that will ride up and down the track with working catenary overhead line, scenery, sound, and working signal light right before the tunnel opening. The whole thing has its own power supply and visitors can also switch the lights on and off and operate the sliding door movement with buttons. The N train movement is automatic.”The layout’s name is (what else?) waGoN, and Martin has posted more information. Its effect provides a surefire magical moment in minimum-space layout building.